You know I've been blogging now for 8 years, and while diet books have come and gone, I've never had more requests to review one than I've had to review Wheat Belly. So last week, while I was on vacation, I hauled Wheat Belly with me. So before my review, here's what I'm not going to do. I'm not going to reinvent the wheel and criticize the science or lack thereof. Not because there's nothing to explore, but rather because others have already done so, and they've done so well. Here’s Melissa McEwen of Hunt, Gather, Love on some of Wheat Belly's many claims, here's Professor Julie Jones' academic's take, here's psychiatrist and blogger Dr. Emily Deans on Dr. Davis' claims regarding wheat and mental illness, and here's my good friend Tim Caulfield and Dr. Davis debating Wheat Belly on CBC's Q. What I'd like to discuss is the diet itself. "you've achieved very little. And you may indeed become deficient in several important nutrients, as well as continue in the unique American shared experience of getting fat and becoming diabetic"
And here I thought wheat was the world's worst food. Seems odd that losing the wheat - a food which according to Davis is basically a highly toxic genetic abomination - regardless of what it's replaced with, would, "achieve very little". Way down below is an extensive list of the foods allowed and disallowed by Dr. Davis' diet, but given that at the end of the day his admonition is to cut out not only wheat, but also pretty much every other source of carbohydrate, and to keep total carbs at between 50-100grams a day (and if you're diabetic, less than 30g a day), truly this is just Atkins minus cured meats, repackaged with a scary, theoretical narrative and a great book title. Perhaps the strangest part of Wheat Belly's dietary recommendations are the book's included menu plans and recipes. As with all of my diet book reviews I calculated the calories the first day provides. Based on the ranges of servings Dr. Davis suggests would be appropriate Day 1 would provide a minimum of 2,156 calories and a maximum of 2,996 calories. Not exactly weight loss material. So I decided to calculate the last day as well (maybe calories start high and go low?). I came up with a minimum of 3,518 calories and a maximum of 3,719 calories. Here's hoping whoever picks up the book doesn't actually bother with Dr. Davis' menu and recipe suggestions as it would seem to me that doing so would certainly not lead to weight loss, but rather would likely lead to gain. That is, unless of course you decide to fast a whole bunch. That shouldn't be a problem because according to Dr. Davis wheat free people are never hungry and can fast, "nearly effortlessly" for, "18, 24, 36, 72 or more hours with little or no discomfort"!? "can be a distinctly unpleasant experience on par with a root canal or living with your in-laws for a month"
The kindest way for me to describe Wheat Belly is as the Atkins diet wrapped in one physician's broad sweeping, yet not particularly well backed up by evidence theory, that wheat's modern genetic modifications are responsible for the majority of society's ills. The harshest would be that Dr. Davis has eschewed his medical responsibility to ensure that the information he conveys to the public while wearing his MD hat is firmly supported by and grounded in science (or at the very least point out when a view is highly preliminary and theoretical), and instead, uses his MD platform to push his own personal theory onto a trusting, vulnerable, and desperate public, as nearly irrefutably factual and scientific. To gain an appreciation as to the scope of Dr. Davis' concerns about wheat, while reading I compiled a list of those conditions that he reports are either caused by wheat's consumption, or cured by its dietary removal. I also compiled a list of more nebulous feel better claims and of the physical manifestations Dr. Davis reports a person quitting wheat might enjoy. The lists are down below but if reading's not your thing, I've created a short video highlighting a hypothetical visit to Dr. Davis' office which includes these same lists. To sum up - I'm not at all opposed to low-carb diets, and agree with Dr. Davis that our society eats far too much in the way of highly processed carbohydrates, and that if we could simply cultivate love affairs with our kitchens our health would improve by leaps and bounds. No doubt for many people low carb diets do prove to be helpful in enabling both weight management and healthful lifestyles, and I'm not even remotely concerned about low-carb health risks as the medical evidence to date doesn't really suggest that there are any worth worrying about. So if low-carb's your thing, feel free to pick up Wheat Belly (just don't bother with the recipes), but please just skip straight through to the dietary recommendations. Or if you'd like to save a few dollars, just grab a used copy of Atkins and eschew the bacon. And lastly, as always, I'll remind you - regardless of the impact of your diet on your weight and/or health, unless you actually like the life you're living (and the food and dietary style you're eating), you're not likely to keep living that way. 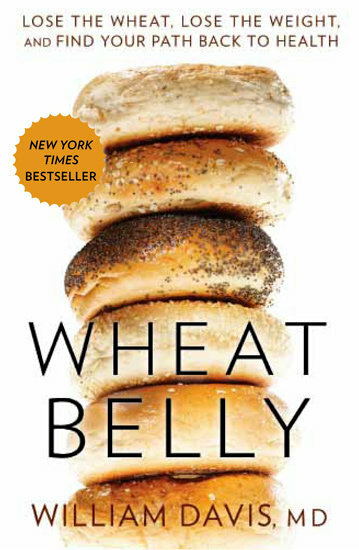 What other than wheat can't you eat on Dr. Davis' Wheat Belly diet? What are you actually allowed to eat on Dr. Davis' Wheat Belly diet?